By Scott Gilfoid: Mick Hennessey, the promoter for unbeaten heavyweight contender Tyson Fury (20-0, 14 KO’s), says Fury is interested in facing former WBA heavyweight champion David Haye (26-2, 24 KO’s) in a stadium fight in the summer. Haye is being talked about returning to the ring on July 6th in the UK against a still to be determined opponent and venue. Wow, it looks like Hennessey is willing to cash out with the Haye fight instead of working Fury to a title shot against IBF/IBO/WBA/WBO heavyweight champion Wladimir Klitschko by facing #1 IBF Kubrat Pulev in a final eliminator bout to get that shot. Hennessey looks like he’s willing to risk everything for the Haye fight. I wonder if Fury is okay with that happening. It’s one thing Fury facing guys like Martin Rogan and Kevin Johnson, but quite another thing to put the long-armed slapper in with Haye. 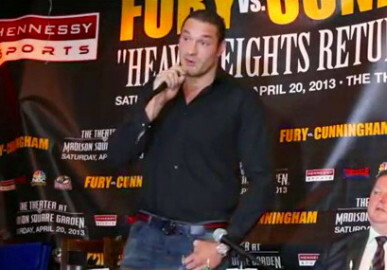 I really wouldn’t like Fury’s chances at all against Haye because he’d have nothing to keep Haye off of him. I mean, Wladimir was able to beat Haye two years ago by a 12 round decision by using his power jab, movement and clinching. But Fury doesn’t have a good jab, and he’s not someone that’s smart about clinching. Fury is kind of stubborn and hot-heated, and he’s more likely to try and slug it out with Haye if he gets close than he would to try and clinch him. That would mean that Fury would get lit up all night long, or at least as long as the fight would last. Haye wins that fight easily and exposes Fury’s glass chin in the process. But at least Fury would get a good payday out of it. Hennessey shouldn’t be assuming anything about Fury necessarily getting past his next opponent Steve Cunningham (25-5, 12 KO’s) next month on April 20th at the Madison Square Garden Theater, in New York, New York, USA. Cunningham is by far the best fighter that Fury has ever faced before, and we could see the tall 6’9”, light hitting Fury exposed in this fight if Cunningham turns up the heat on him and goes for his jaw. I can see Fury tasting canvas in that fight big time, and once Cunningham has the tall Brit hurt, he’ll finish him off for sure.